The Nûby™Safari Chimes™are interactive toys that blend both fun and function. They feature bright colors, playful sounds, a variety of textures and fun characters that are sure to captivate your baby's imagination. Additionally, they hang from a clip that easily attaches to stroller, high chair, car seat, etc. I always like to have some toys on hand when I'm out and about with Baby Boy. I was excited to see if he would like the Nûby Safari Chimes. I was sent the alligator chime which is perfect because we LOVE alligators in this house. It's the theme of Baby Boy's nursery and the boys here are HUGE Gator fans! I hung this on Baby Boy's car seat and he immediately starting reaching for it. He continued to play with it while I was driving for quite a bit. (I obviously don't have any pictures of that- you'll have to take my word for it ;) The Safari Chime hangs at the perfect height for little hands to reach for it, plus it's bright and colorful to grab their attention. Additionally, it sounds like a little bell- not too loud at all. This will be a new fixture on his car seat for entertainment. 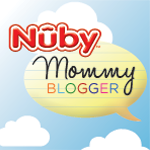 Follow & Connect: You can connect with Nûby on Facebook or Twitter. Cute! It's nice the bell isn't really loud. When my son squeezes squeak toys it drives me nuts- ack! Oh! What a great toy! Looks like he's having fun! Oh I have some baby showers coming up, I need to keep this in mind! Very cute!